The company behind Fortnite is suing the organisers of a live event based on the video game. Exciting Events ran the unofficial "Fortnite event of the year" in Norwich last weekend, which was criticised for having underwhelming attractions. American firm Epic Games confirmed it had "issued a claim against the organisers" in London's High Court. In an email sent to a ticket holder, Exciting Events said the festival was set-up as an "unofficial" fan event. 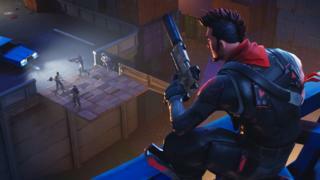 But a spokesman for Epic Games said: "The quality of our player experience is incredibly important to us, whether it's inside the game or at official public events like last year's Fortnite Pro-Am. "Epic Games was not in any way associated with the event that took place in Norwich." Angry parents hit out at the live event, complaining of long queues and underwhelming attractions. Justine Petersen, who queued for 90 minutes to get in with her husband and her nine-year-old son, said it was "like the episode of Father Ted when the fair comes to Craggy Island". Tickets for the event, themed around the global video game sensation, started at about £12, with wristbands for unlimited access to activities costing an extra £20. Since the event people have demanded refunds on Facebook. In an email sent to a ticket holder seeking a refund, Shaun Lord, a director of Exciting Events, admitted problems with queues but said: "The vast majority of children loved Fortnite Live Norwich." He added: "Fortnite Live has always been an unofficial event created by Fortnite fans... with the activities brainstormed by an audience of 10-14 year olds. "These proceedings by Epic Games has forced Exciting Events Limited to cease all trading activities immediately and the director of Exciting Events will now seek to limit the losses to third parties as far as possible." Exciting Events has removed Fortnite festivals planned for Spalding and Newark from its website. The BBC has asked Exciting Events for a comment.